The U.S. Supreme Court is considering the constitutionality of President Donald Trump's travel bans, which were done through executive orders. Among other issues, the actions have raised the issue: What are the limits on presidential executive orders? The concept of presidential executive orders dates to George Washington, and every president has issued them, except for William Henry Harrison, who served only a month in 1841 due to his unexpected death from pneumonia. The nation's courts have generally given considerable deference to executive orders, but there have been notable exceptions. No specific provision in the U.S. Constitution permits presidential executive orders although scholars have generally agreed that the power is derived in Article 2, Section 3 of the U.S. Constitution. It says, in part, the president “shall take Care that the Laws be faithfully executed.” Since 1789, there have been more than 7,300 presidential proclamations, which carry the power of law and compel all U.S. citizens, agencies and businesses to follow them. President Abraham Lincoln is credited in 1862 with issuing the first “executive order” with that name. Subsequent presidents can reverse earlier executive orders, and often do. Perhaps the most enduring executive order was Lincoln’s Emancipation Proclamation on Jan. 1, 1863, freeing all slaves in the rebellious states. It later served as the foundation for the 13th Amendment. These orders went largely unchecked by the courts until President Harry Truman signed Executive Order 10340, which placed all U.S. steel mills under federal control during the Korean War. Later that year, the U.S. Supreme Court ruled 6-3 in Youngstown Sheet & Tube Co. v. Sawyer that President Truman had overstepped his authority because he attempted to make law rather than clarify an existing piece of legislation. In that decision, Justice Robert Jackson, in a concurring opinion, put forth a three-part test related to the overreach of presidential power that is still relied upon by courts today. Jackson said the president’s powers were at their height when he had the direct or implied authorization from Congress to act; at their middle ground or “a zone of twilight,” as he put it, when acting without either a congressional grant or denial of authority; and “at its lowest ebb” when a president acted against the expressed wishes of Congress. Since then, presidents have exercised more restraint and usually cite specific laws when signing an executive order. Still, a Yale Law Journal study found that of the 34 executive orders that President Barack Obama issued in 2011, only 15 claimed any specific law or laws as their source of authority. 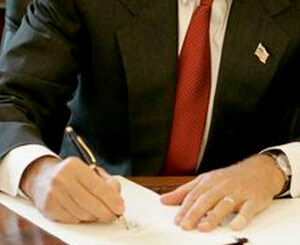 In 2003, 23 of the 41 executive orders by President George W. Bush cited a specific statute as a source of authority.